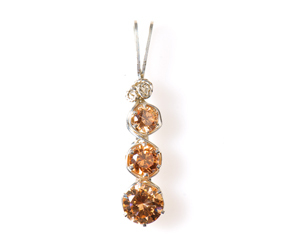 When you have a solid grasp of wire jewelry components, you'll be completely unstoppable as a jewelry designer! 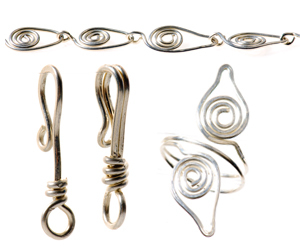 From wrapped loops to component links to making your own clasps and ear wires, these techniques will be great tools to tackle any wire jewelry pattern, plus, they'll lay the foundation for your own inspired wire jewelry creations! 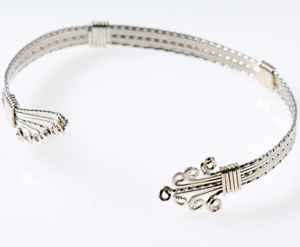 As taught, this bracelet cuff is lovely as a feminine bracelet - but once you've mastered this technique, you can create a myriad of variations and use the principles to create beautiful, versatile wire jewelry pieces for a wide range of uses! Lesson 3 - Lock That Rock! 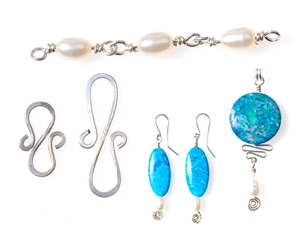 Round stones and shapes, like marbles and freeform crystals, are among the hardest items to wrap in wire-which is why Dale 'Cougar' Armstrong is teaching them! 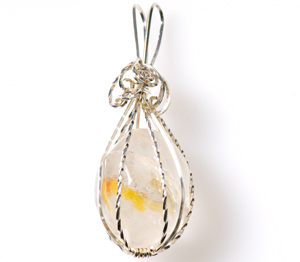 This video will prepare you for professional wire wrapping in this class to make a pendant, complete with a finished bail, from your item! Wrapping an oval cabochon or cameo is a technique Dale "Cougar" Armstrong has become well-known for; it's a technique she teaches in classes across the country in person, and now she's ready to teach you this fine technique in the comfort of your own home! 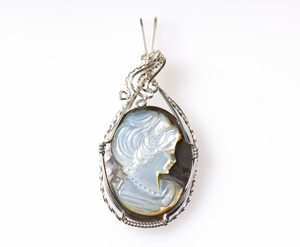 All you'll need is wire, jewelry pliers, tape, markers, and a ruler to execute this timeless design - oh, and of course, a cabochon or cameo! Like Lesson 1, this class builds on components - specifically, the Leaf Link component. Dale shows several examples of the leaf link component in action, including a bracelet, ring, and chain. This design could be a leaf, an evil eye, or even a hidden leaf - as many uses as you can think of, this link will meet them all! Total DVD run time is 4:49:09. This DVD series does not have subtitles at this time, but does come with complete follow-up instructions.